Smyth's Toy Superstores – making children's dreams come true. Recently I was invited to review the new Smyth's Toy Store catalogue with the children and then take them shopping to review the shop itself. Couldn't really turn that one down, could I? So we were sent a catalogue and some gift cards, and the children began compiling their wish list. 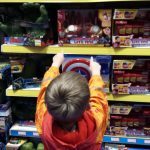 It turned out … [Read more...] about Smyth's Toy Superstores – making children's dreams come true.